On March 22, the Growing Greener Coalition issued a call to action to the public to urge members of the Senate and House and Gov. Wolf to make new investments in restoring the environment and preventing flooding and not to back away from funding commitments they have already made. -- Tell them to leave the Keystone Recreation, Park and Conservation Fund and the Environmental Stewardship (Growing Greener) Fund untouched in this year’s budget. Pennsylvania can’t afford to backslide in its community and conservation investments. Learn more. -- The Governor calls for substantial conservation investments in his Restore Pennsylvania proposal (which addresses a variety of infrastructure projects). 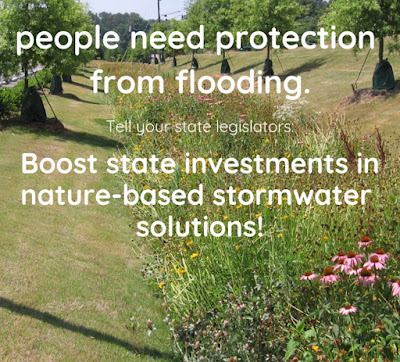 Ask your legislators to work with the Administration to make these conservation investments. Read the Growing Greener Coalition’s letter to members of the General Assembly and Governor Wolf on this subject. You can also post on social media by tagging your legislators and using the hashtag #RestorePA. Here is a set of social media graphics highlighting the need for boosted investments in protecting water, conserving land, and improving communities. Click Here to learn more and take action.